It's pretty clear when a trend has matured. You hear about it on the sidelines of kids' sports events, at worship services, and at cocktail parties. What started as self-funded ventures or Kickstarter campaigns starts attracting multiple rounds of private investment. Valuations swell. IPOs loom. That's what's happened with the personal drone industry, which crossed that milestone last summer when Martha Stewart penned a love letter to her DJI Phantom in Time magazine. The arbiter of modern taste cooed in America's leading mainstream periodical: "In just a few minutes I was hooked. In near silence, the drone rose, hovered, and dove, silently and surreptitiously photographing us and the landscape around us." Although the FAA is still trying to figure out the legality of drone operation the industry is really heating up with new competitors, new products, rapid revenue growth, and a feeling that critical mass has been achieved. I'm just skimming the surface here today, but there many interesting stories to be told. Such as how Shenzhen-based DJI and founder Frank Wang have become the Apple and Steve Jobs for the industry -- offering attractive, easy-to-use, well-engineered, complete products marrying hardware and software to become the standard of quality. 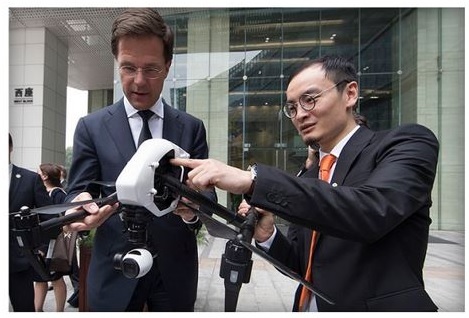 Wang, at right above with the prime minister of the Netherlands, even wears a variation of Jobs' trademark round-lensed eyeglasses. DJI represents one of the first examples of Chinese talent leading the way in a new consumer product category. With 2,500 employees and offices in places like Los Angeles, Rotterdam, and Tokyo, revenues are expected to hit $1 billion after eclipsing $500 million last year, four times its haul in 2013. After a $75 million funding round from Accel Partners -- an early investor in Dropbox and Facebook -- the company is eyeing a $10 billion valuation. According to CBI Insights, drone funding was up 104% between 2013 and 2014 and is continuing to accelerate as established players try to expand their reach. The new strategy from the likes of DHI and Airwaves is to fund smaller startups in the space in an effort to create an Apple-like ecosystem around themselves. DJI is coming under some pressure from 3D Robotics, a company started by former Wired editor-in-chief Chris Anderson in 2009 that just received $50 million in third-round funding from Qualcomm. QCOM's technology is helping to power 3DR's upcoming Solo "smart drone" featuring dual Linux-based processors to automate flight parameters and offer full control of mounted GoPro (GPRO) cameras. There's a human dynamic in the brewing battle between DJI and 3DR, as DJI's former North America CEO Colin Guinn, the former Hollywood aerial photographer who helped popularize drones in a series of YouTube videos, defected to 3DR after falling out with DJI's Chinese executives over business terms, according to the Verge. His input helped bring the Solo to fruition. For the average investor, both DJI and 3DR are still untouchable as they are private. But there are ancillary companies. GoPro shares are a decent buy now that it has pulled back, as it is the leading camera on consumer drones. And of course my longtime favorite, Ambarella (AMBA), which makes the high-definition video chipsets and video compression software that make the GoPro cameras go. 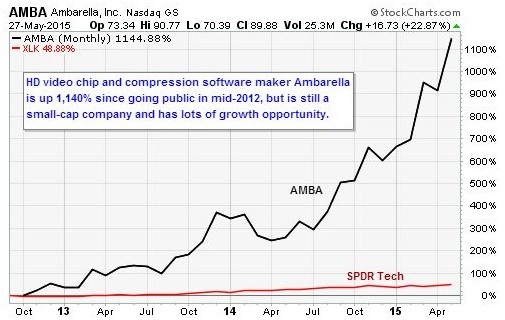 You may recall that I recommended Ambarella at the start of the year for the Investorplace Media feature, "10 Best Stocks for 2015" feature, and it has not disappointed, racking up a 77% gain in five months so far. AMBA has been on fire with a gain of 30% this month alone, and will be worth watching for an entry point on the next dip -- probably after earnings are reported amid high expectations next month -- as 4K drone vision becomes the next step. The company also has exposure to another of my favorite area, autonomous vehicles, and is also the leading maker of Internet-connected cameras for the ubiquitous surveillance cameras that are unfortunately a part of modern life. My only fear is that AMBA will be bought by a company like Qualcomm (QCOM) before it has a chance to reach its full potential as an independent concern. Another potential pick in the space is InvenSense (INVN), the maker of micro-electro-mechanical gyroscopes used for position tracking. It's not ready to buy yet, but I have my eye on it. I'll have more of these ideas for you in coming weeks and months. -- Sign up for a free trial to Strategic Advantage to see ideas like this every day. -- Sign up for a free weekly Change Log report on the ways technology is changing business, health care and culture. A look at why VZ is paying $4.4 billion for AOL, the old slinger of dial-up CDs.